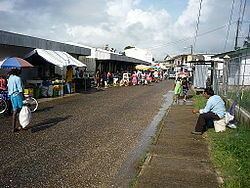 Punta Gorda, known locally as P.G., is the capital and largest town of Toledo District in southern Belize. Punta Gorda is the southernmost sizable town in the nation, with a population of about 5,000 people. Although the town bears a Spanish name, its inhabitants are mostly Kriol/English-speaking, and are primarily of Garifuna, East Indian, Kriol, and Maya descent. Punta Gorda is a seaport and fishing town on the Caribbean Sea. It was a small fishing village before it was settled by a number of Garifuna emigrants from Honduras in 1823. The Garifuna refer to the town as Peini. The town is about fifteen feet above sea level. Punta Gorda is the main point of transportation for people visiting the Toledo district and the offshore southern cayes. There is a small airport which serves domestic flights from Maya Island Air and Tropic Air. James Bus Line is based in Punta Gorda and offers a regular service to points north such as Independence, Dangriga, Belmopan, and Belize City. Water taxis offer daily crossings to Puerto Barrios and twice weekly service to Livingston in Guatemala. Unlike the purpose-built water taxis plying the routes between Belize city and the northern cays, the services from Punta Gorda are provided by small, open boats. There are several hotels in Punta Gorda that draw tourists with their ocean views. Punta Gorda is also a gateway to several well-regarded jungle accommodations, including Cotton Tree Lodge, The Lodge at Big Falls, Belcampo Lodge, and Hickatee Cottages. Every May the town hosts the Toledo Cacao Festival, held over the Commonwealth Day holiday weekend, which celebrates Toledo district's ancient and modern-day links with cacao and chocolate. Notable people from Punta Gorda include paranda musician Paul Nabor and Belize's "Queen of Brukdown", Leela Vernon. St. Peter Claver Catholic parish, with a large elementary school, serves the predominantly Catholic population of the town. The town is served by Punta Gorda Hospital.